You'll be £8.99 closer to your next £10.00 credit when you purchase Women's Suffrage in Wales. What's this? Women’s Suffrage In Wales allows its readers to take a glimpse at the lives of the many ordinary Welsh women who contributed in some way to the suffrage movement. Although suffragettes from across the rest of Britain, such as Emmeline Pankhurst and Emily Wilding Davis, have become household names, little is ever mentioned about the women living in Wales who fought for equal opportunities and the right to vote. Women’s Suffrage in Wales seeks to readdress this balance. Within her book, Lisa Tippings has chosen to focus on the lives of the mainly working class women who realised the movement gave them an opportunity to embrace change. Despite living in difficult conditions, the wives of colliery workers and everyday labourers overcame lives of poverty and squalor, to help fight for better lives for those women so often neglected and marginalised. The book also highlights the key role played by important female figures from Wales’ past; names in jeopardy of falling into obscurity. Close attention is paid to Gertrude Jenner, Amy Dillwyn and Elizabeth Andrews amongst others, who in spite of their own difficult circumstances, dedicated themselves to making the lives of those around them more fulfilling. At the same time they ensured that future generations of Welsh women would enjoy a never before experienced sense of freedom and liberty. The author has done an excellent job of including the context of the setting which adds a ton of value in understanding, sympathizing, and learning about the motivations of these incredible women... The people are simply inspiring If you have an interest in the suffrage movement this book is a great start! 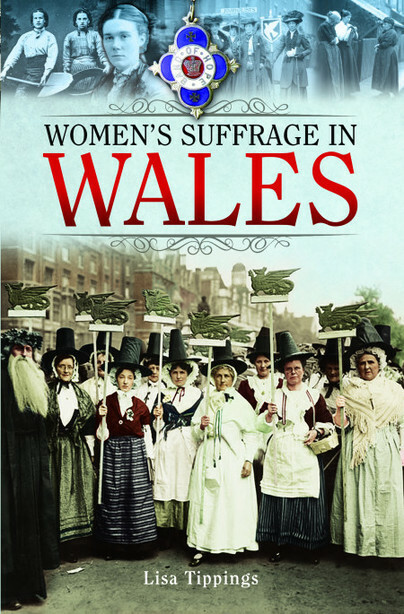 If you’re looking for a book to provide a good historical introduction and overview of women’s suffrage in Wales then this is it. It introduces the key players and does a really solid job of placing a dynamic movement in a Welsh context. It provides a Welsh angle to a very important historical topic that is often generalised as a British issue. Lisa Tippings is based in Swansea but was born in the south Wales valleys. She is passionate about social history and in particular the role played by Welsh women in cultural and political developments from the nineteenth century onwards. She has been published widely in education and history magazines and is currently writing her first novel.